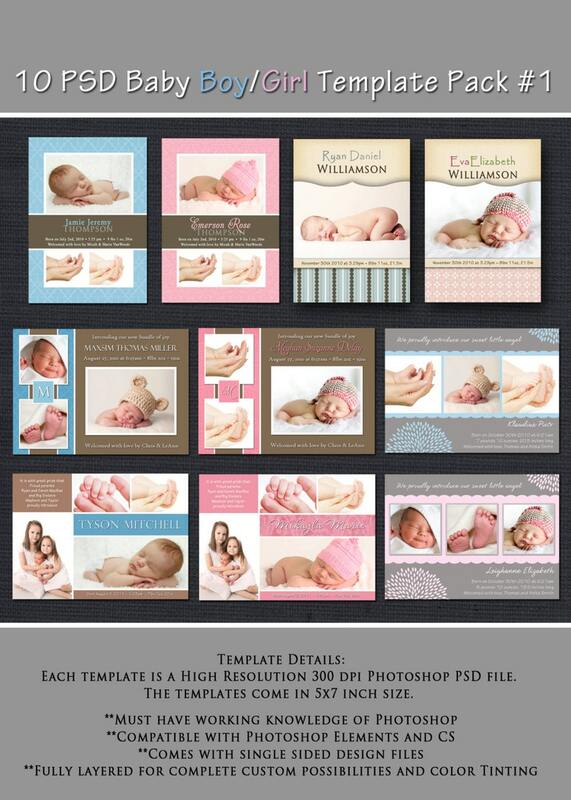 This listing is an INSTANT DOWNLOAD for a Set of 10 Photoshop PSD Files - Baby Boy/Girl Combo Birth Announcement design template files. - All files are previously uploaded to Etsy and sent via email to you once payment has been received/completed. - Instant download purchases can also be download by going under "Your Account" top right corner of the Etsy page, then under "purchases". There will be a download link beside the corresponding purchase. - Should you not receive your instant download within 1hr, and have checked spam folders, please email me at [cheryl@whimsicalcreations.ca] and I'd be happy to help you. Each template is a High Resolution 300 dpi Photoshop PSD file. The templates come in 5x7 inch size. Purchasing these templates gives you the right to use the designs for home/personal AND COMMERCIAL Use.